Opened at the Australian Catholic Youth Festival last December, the Year of Youth concluded on Saturday, the final day of the Church’s liturgical year.Sydney Archbishop Anthony Fisher OP, who has served as Bishop Delegate for Youth for the past several years, said having a group of 15 young people celebrate Mass and break bread with the bishops gathered for their plenary meeting was a fitting way to close the Year of Youth. “Born as an opportunity to celebrate 10 years since Sydney’s World Youth Day in 2008, the Year of Youth has become so much more than we expected,” Archbishop Fisher said. “This year, together with the General Synod of Bishops on Young People, the Faith and Vocational Discernment, has provided new insights and opportunities for young people and the Church to come together. Some of the young Catholics were invited to address the bishops and provide their own reflection on the Year of Youth. 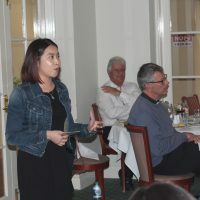 Adeline Bock, who was Catholic Youth Ministry Perth’s Year of Youth project worker, said the next Australian Catholic Youth Festival in December 2019 will be a great chance to continue the momentum that was gained over the past year. “We want to link the Year of Youth forward,” she told the bishops. Ms Bock said one of the important roles that she and other young people must take up is reaching out to the unchurched. “Do we have the Joy of the Gospel in ourselves that shines forth and that other people see and want to have in themselves? It is our job to be witnesses and tell the story of Jesus and how we have encountered him in our lives,” she explained. Krishmalie Perera, part of the Year of Youth team for the Diocese of Broken Bay, said “young people are hungry for the Faith and they have a deep longing to be listened to”. “The Year of Youth has placed them at the centre of the Church to be listened to and to take initiatives, take risks,” she said. Malcolm Hart, director of the ACBC’s Office for Youth, said the end of the Year of Youth should be seen as much as the start of something as the conclusion of something. “We have heard from and engaged with young people in ways we haven’t previously been able to, and the voices we heard will resonate through the Catholic Church for many years,” he said. The Office for Youth has released a video to mark the end of the Year of Youth.